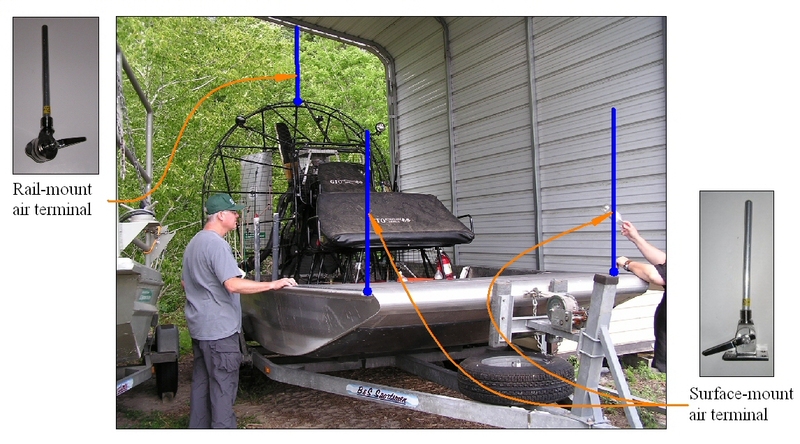 Owing to its shallow draft design, the typical airboat tends to spend much of its active life in low-lying marshy areas. This type of environment is not particularly suitable for tall trees, high bluffs or other high objects that might provide alternative attractive targets for a lightning strike. Add in to this mix the preponderance of prime airboat territory in steamy southern states such as Florida and Louisiana, and the potential for personal injury becomes obvious. To make matters worse, the raised driver's seat, while great for improving the view over marsh grasses, further increases the odds of a direct lightning attachment to the operator. Passengers near the bow are also exposed. This is a particular concern for airboat tour operators as it raises yet another risk – that of liability exposure. The USGS airboat above is used by scientists to gather wildlife and geological data at all times of the year so that braving summer thunderstorms is just a part of the job. While running for cover from threatening weather is a pragmatic course of action, it is not feasible to abort every experiment at the first sight of a towering cumulus. Invariably a storm blocks the exit path and the only course of action is a white-knuckled run to safety. This does not have to be a life-threatening situation as well. The place where lightning connects to an object on the ground is determined by a process called the attachment streamer. This hundred-foot spark originates from the ground and carries charge of opposite sign up towards the downward extending lightning channel. When a person is struck by lightning, this attachment streamer invariably starts at the top of the head and involves current flow throughout the length of the body. Once the conducting path is formed by the attachment streamer, a peak current of tens of kiloamperes follows down the same path after the streamer connects with the main lightning channel. About half the time, this current flow results in cardiopulmonary arrest and death. The function of a lightning rod is to initiate this attachment streamer and conduct the current safely to ground. The ideal lightning rod should be the optimum shape for its job. Obviously its top needs to be higher than all other objects on the boat but there are other important factors. Recent scientific research has shown that blunt rods are much more effective than pointed, and the most effective diameter is between 3/8" and 5/8". While the "cone of protection" afforded by a single rod has been touted as the way to calculate the zone of protection, several lightning rods around the perimeter of a boat are much more effective than a single rod in the middle. Note that NASA has recently changed the design of its lightning protection systems at its launch pads from a centrally-located rod to a ring of masts around the perimeter of the complex with catenary cables strung between adjacent masts. One problem with placing lightning rods on the corners of an airboat is that some activities, such as docking, require open deck space. Fortunately, this problem has already been solved, albeit for vhf antennas, by using ratchet-mount bases that can be locked in either up or down position. We customize these bases to accept UL-listed aluminum rods, with appropriate attention being given to galvanic and conductivity issues. Since a metal-hulled airboat requires no further grounding, these air terminals can be simply attached to any metal structure to provide the required continuous conducting path to ground. We call this new product the ZzapRodTM. It can be used not only on an airboat, but also on any craft wherever a collapsible lightning rod is needed, from jon boats to superyachts. Following NASA's lead, we no longer recommend the use of the "cone of protection" for planning where to place lightning rods on small boats. Instead, we adopt the "rolling sphere method" used by lightning protection authorities such as the National Fire Protection Association. The main difference as far as implementation goes is that more than one lightning rod is required. Simply stated, the protective zone is adequate if a sphere with a radius of 100' contacts only lightning rods when it is rolled over the boat. For a small boat there is very little difference between the arc of a 100' sphere and a straight line. Hence in the USGS airboat at the top of the page we have placed three lightning rods, two at the bow and one behind the driver, with sufficient heights that the hatched surface is above the top of the heads of all occupants while standing. In a metal hulled boat, no further grounding is required. Hence all that is required is to secure each ZzapRodTM to either a flat surface (using a surface-mount fitting) or a tubular structure (using a rail-mount fitting) The surface-mount fitting require four holes while the rail-mount fitting merely bolts on with no holes required. See the inset views in the illustration at the top of the page. While the ZzapRodTM is designed to significantly lower the risk of injury by diverting the lightning strike point from an occupant to itself, it cannot be expected to be 100% effective and being this close to the strike is still extremely hazardous. Hence reasonable additional care and precautions are recommended. Enhanced protection can be obtained by adding catenary wires to interconnect the tips of ZzapRods. The ZzapRodTM comes with various mounting options to allow for attachment to deck or the motor cage. All versions have ratchet-mounts to enable the rod to be dropped out of the way if needed. Our surface-mount air terminal (SMAT) is designed to be installed on a flat horizontal surface, typically the forward deck, to extend the protective zone over any passengers and enhance the zone over the driver. For docking, trailering, or cloudless days it can be lowered to deck with its tip secured in a rod clip on the deck or inboard. Our rail-mount air terminal (RMAT) is meant to be mounted on a 7/8"-1" or 1.25"-1.5" diameter tube at any orientation, such as are typically found in the motor cage. Since Florida law requires an orange flag at height of 10' from the bottom of the boat, this lightning rod can double as a flag pole. A convenient location is just to the right of the driver where it can be lowered vertically down for trailering. After talking to several airboat builders it became obvious that contact between foliage and airboats is a very common occurrence. In response to this, we are working on a flexible coupling that can be added to both surface and rail mounts to absorb the occasional impact with vegetation. To accommodate more serious interactions, we plan to combine the flexible coupling with replaceable rods that can be simply screwed into the coupling.